Later this month, the state will begin reviewing proposals for up to 2,000 new private prison beds - only a few weeks after a riot in a private prison just outside of Kingman left 16 people injured. The governor has called for an investigation, but might allow the Department of Corrections to investigate itself. And he has given no indication that he has reconsidered the millions he has committed to the private prison industry, while slashing the budget for education and for safety net programs. Why would the governor pay the fox to guard the hen house? Where is the accountability? There should be no new money for private, for-profit prisons in Arizona until there is a full, independent investigation of the entire corrections system. The riot is the latest in a list of incidents involving private prisons that raises public safety concerns. This facility is the same private prison that allowed three inmates to escape, who then went on to kill two people. For years, House Democrats have urged for more accountability for all prisons including private facilities. Republicans instead have pushed for more facilities while reducing oversight. Also, in many cases, they have offered occupancy guarantees to these for-profit, private prisons. So, Republicans have promised to either keep private prisons full, and even if they don’t, the state will still foot the bill. Republicans repealed a state law requiring a comparison of state and private prisons every two years to ensure that private prisons were providing the same quality of services as state prisons at a lower cost. Before the law went into effect, we knew that Department of Corrections Per Capita Cost Reports compiled over five years consistently showed that the state is losing money on private prisons, and security audits show serious safety flaws in all of Arizona’s for-profit prisons, including malfunctioning cameras and alarm systems. 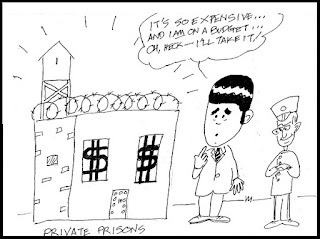 Let’s #AskDuceyWhy for-profit, private prisons continue to get state support, despite ongoing concerns about accountability, safety and responsible use of taxpayer money.